How do we empower people to learn and teach? 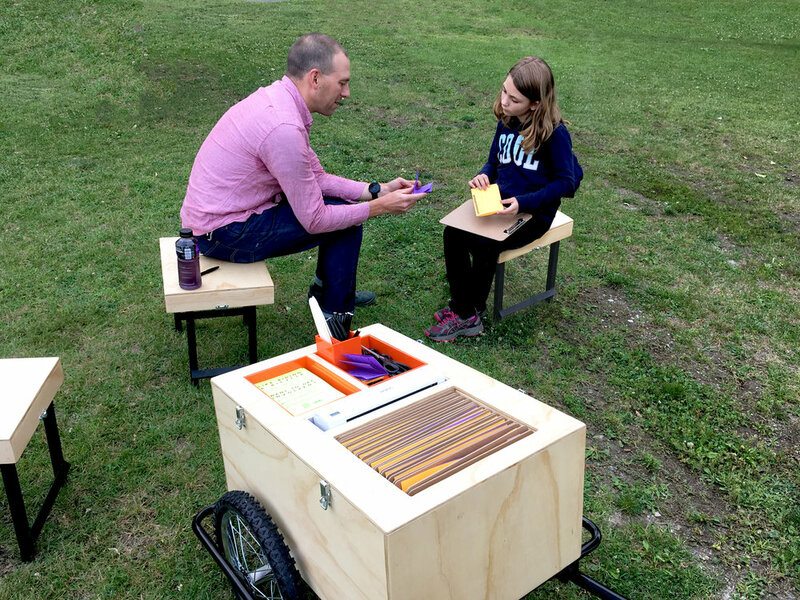 Like Riding a Bicycle (Brett Hunter and Katie Hargrave) organize public events for groups of all ages and backgrounds to visualize their own knowledge in order to build both individual and collective power. Our projects are interactive and collective; people ride bikes, tell stories, and explore their neighborhoods together, creating a collective body of knowledge. We use well-known cultural forms (publications, tours, workshops) in new ways, allowing for participants to be surprised by what these forms can accomplish when pushed beyond the expected. Our work develops over time, is responsive to diverse situations, and it is co-created with participants. Most importantly, the work is a proposal to our participants: share what you know, teach your neighbors, and by doing so we will remember the power we each have. Katie is a socially engaged artist and educator based in Chattanooga, TN. In addition to her artistic training, she choose to study at Brandeis University with anthropologists as a way to develop ethical practices for working within communities. She also brings a history as a union organizer and the skills of mapping complex networks to this work. Katie is devoted to building confidence in others and helping people see their skills, both as a professor and within the work of Like Riding a Bicycle. Brett is an artist, educator, and facilitator living in Hornell, NY. He is dedicated to building partnerships between institutions, individuals, and communities. Brett is trained as a sculptor, contractor, historian, and teacher. He combines these experiences to develop creative methods to engage people and infrastructure of a place. He works acros civic and educational institutions to create community-based arts organizations and programing that engage people of all ages. Bicycles are a symbol for us of skills that we might have and take for granted. They represent knowledge that is shared, often informally, between generations, friends, and community members. More practically speaking, bicycles are a transportation tool, a device for better health, but also they are a means to explore, to notice the world around us as we move through it. Bicycles move at a speed that allows us to notice. We slow, we stop, and we look closer. We believe bicycles are a way to bring people together, to share their neighborhoods with one another, and to discover the knowledge that exists all around us in the minds and experiences of our neighbors. We believe in cycling because it creates engaged citizens and benefits public health--allowing one to move at a speed to notice changes in the built environment every day, build connections with the neighbors you see along your route, while relieving some of the pressure for speed and multi-tasking we are experiencing in our contemporary culture. Like Riding a Bicycle has participated in exhibitions and public events throughout the country. We are most excited to work with partners that are motivated, help us to understand the local context, and who grow alongside us. In an ideal project we are pushing ourselves to develop new engagement methods while facilitating knowledge acquisition for our community partners and their stakeholders. We have worked with non-profits, community development and advocacy organizations, festivals, and galleries on projects of all scopes and sizes from one-hour events to projects that last through several months.